Scale Model News: ARE YOU A COLLECTOR OR A CRAFTSMAN? OR MAYBE BOTH! ARE YOU A COLLECTOR OR A CRAFTSMAN? OR MAYBE BOTH! It’s an old argument between model fans - should you buy ready-built models, and collect your kicks from the collecting habit? Or should you make your miniatures, and get your groove from the craftsmanship involved? As ever, there are two sides to every story - and in this case, more than that. For example, it’s possible to buy a ready-built model and improve it with weathering or extra detail. Or buy a snap-kit to cut down assembly time, a good half-way house for those us us who don’t have time for a full-on model making hobby. And even if you reckon the ‘true way’ is assembly with loving care, things are not clear-cut - after all, balsa-and-tissue craftsmen once dismissed plastic kits for making things too easy! But where the line has really blurred is with the results of competition between diecast makers in providing ever-higher levels of detail. And nowhere is this more apparent than in models of older subjects, especially aircraft of the pre-World War II era. Just have a look at Hobby Master’s beautiful 1:48 scale Boeing P-26A monoplane of 1932, shown above in model form and the full-size replica on display at the US Air Force Museum, Ohio. This is one my all-time fave aircraft, and was the world’s first all-metal production fighter, sporting such advanced features as enclosed wheels for streamlining and extra speed. Even so, the ‘Peashooter’ was something of an in-between design, with an open cockpit and tensioning wires, both standard fittings on this class of aircraft up to that point - and that’s where Hobby Master (and other manufacturers, such as Corgi) hit a home-run in the detail stakes. For these rigging wires are so beautifully fitted that even old-stager model makers like me cannot compete. So even if we’re only talking rigging wires, in this case very few model makers are even in the same ballpark - and I take my hat off to those of that are! 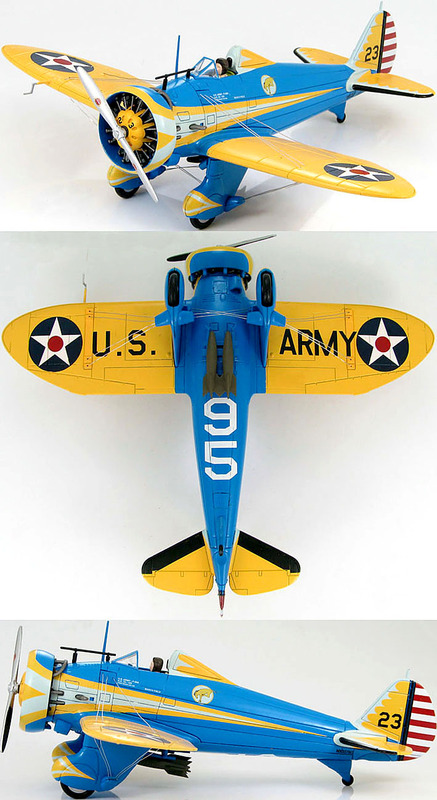 1 Three views of Hobby Master's 1:48 Boeing P-26A. 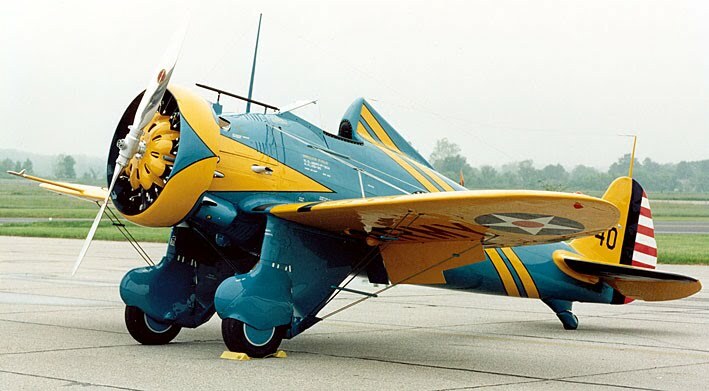 2 Full size replica P-26A at the USAF MUseum. UK online store JohnJohn has some P-26 Peashooters to look at here. Visit the USAF Museum here. And here are some more Peashooters in various scales.